Can I pause an annual plan? I'm trying to pause my subscription, but I'm not seeing the right buttons. 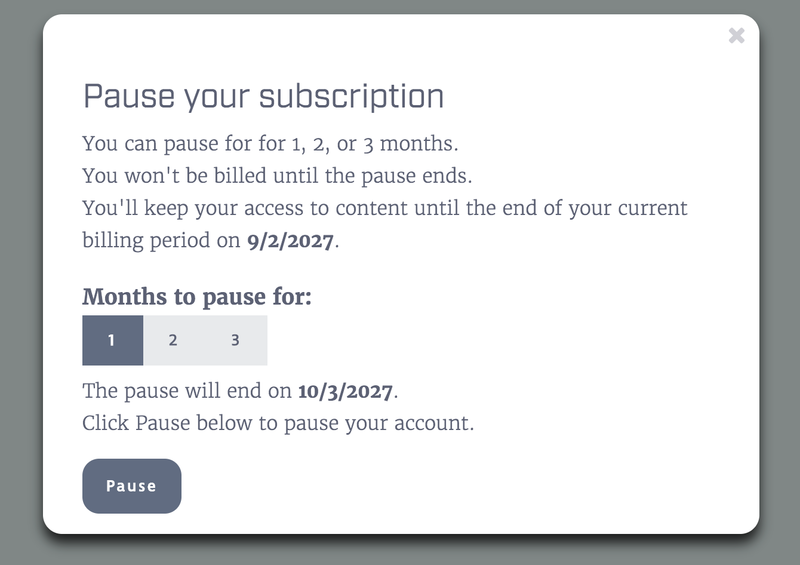 Pauses allow you to temporarily cancel your monthly subscription and set it to re-start in 1, 2, or 3 months. Pauses take place after the current billing cycle — think of them as pauses in between subscription renewals. For monthly plans, this means that the pause would take place after your current billing cycle ends, regardless of when you initiate it. In short, your pause doesn't postpone the expiration date of the month you've already paid for, but it postpones the date that your monthly plan renews. Bob is a student who has signed up on 6/1 for a premium monthly plan. His renewal date is a month from then, on 7/1. On 6/15, Bob decides that he's a bit too busy to study for the next few months, so he decides to pause his subscription for 2 months. Although he's initiated the pause on 6/15, it doesn't go into effect until 7/1 — he will maintain access to the platform up until that date. Once the pause goes into effect, he will not be billed until 9/1. During this period, his level of access will go back to what it was under the Free plan — he will no longer be able to access the missions that the Premium plan unlocks. ⚠️Please be aware that you cannot pause for periods less than one month long. It's possible to initiate a pause on an annual plan, but it is significantly less useful than it is for those on the monthly plan. As is the same case as the monthly plan, pauses take place after the current billing cycle For annual subscribers, this means that the pause wouldn't take place until after your current billing cycle ends the following year — this is the reason we give such a significant overall discount over the monthly plan, as you're giving up your flexibility in exchange. To put it simply, your pause doesn't postpone the expiration date of your current plan, but rather, it postpones the date that your annual plan renews. Pausing your subscription is an easy 4-step process. Navigate to your account page. At the bottom of your account page, click Pause . Select the length of your pause: 1, 2 or 3 months. Will you remind me when my subscription is about to unpause? A few days before your pause ends, we will email you to remind you that your subscription is about to restart. At this time you can choose to either do nothing and let it restart, extend your pause, or cancel your subscription. If you wish to restart your subscription early, you can do so by visiting the subscribe page. In the case you're trying to cancel your account but you're not seeing the pause options above, you may be running into the Team Account bug, which occurs when you've created a team — it prevents access to your personal account management page and, instead, only gives you the option to manage your team. Not to worry — our Support team would be glad to help if this is the case. Just shoot us an email and we'll get you on your way!